The Samsung Galaxy Tab features a gizmo called an accelerometer. It determines in which direction the Tab is pointed or whether you’ve reoriented the device from an upright to a horizontal position, or even upside down. That way, the information on the Tab always appears upright, no matter how you hold it. 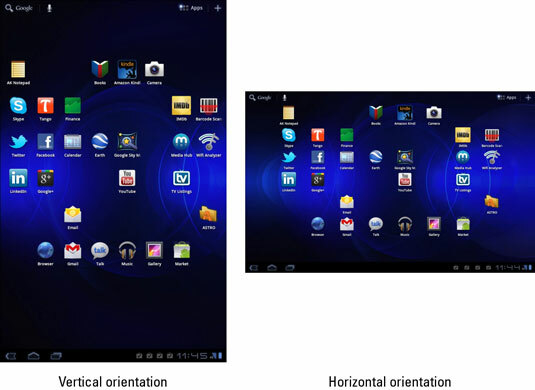 To demonstrate how the Galaxy Tab orients itself, rotate the Tab to the left or right. The Tab can be used in either vertical or horizontal orientations. Most apps change their orientation to match however you’ve turned the Tab. The rotation feature may not work for all apps, especially Android apps designed for use on cell phones and not tablets. Some games present themselves in one orientation only.